Make your Sinulog celebration more fun and memorable by getting a very cool photo shoot from The Bloggers’ Sinulog Photo Booth. 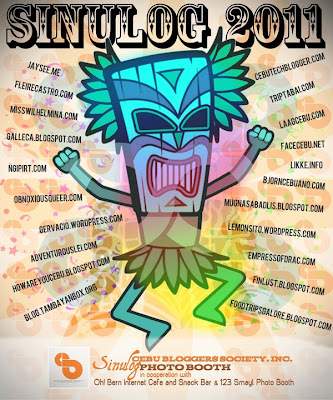 Along with all the feisty Sinulog activities on January 16, 2011, Sunday, the Cebu Bloggers Society, Inc., in cooperation with Oh! Bern Internet Cafe & Snack Bar and 123SMAYL Photo Booth, puts up Smile and Shoot – The Bloggers’ Sinulog Photo Booth. This photo booth will be operating from 8am to 6pm that day and is located at the front area of Oh! Bern Internet Cafe & Snack Bar along Osmeña Boulevard, across the CAP Building and beside Da Vinci’s Pizza. Soft copies will be available for FREE at the CBSi’s Facebook Page. With this activity, we aim to capture the timeless smiles of those who celebrate the Sinulog festival. We hope to see you there with your friends and families! may I repost this, MArkey?